Stars are self-luminous gaseous spheres. They evolve and finally die. Their source of energy is the nuclear burning of the material they are made of. At the first stages of their lives they contain only Hydrogen (H) and Helium (He). With a series of nuclear reactions they convert H and He to heavier elements [e.g. Oxygen (O), Iron (Fe), etc]. This graph shows the structure of an evolved massive star of 20 solar masses. The heaviest elements are closer to the core of the star (e.g. Fe), while the outer shell still comprises of H and He. The core of the star is very compact and heavy. 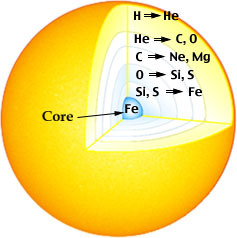 Once a star has reached this structure, the nuclear burning stops; the iron core will not ignite to induce further nuclear burning as has happened earlier to the He, C, O, and other cores. The reason is that Fe can't burn. The fact that iron does not burn leads to the collapse of the star's iron core. Extremely hot, massive stars (with masses more than about 10 times that of the sun) burn their supply of hydrogen and helium very quickly. Once this fuel runs out, they end their lives in a spectacular explosion, known as a supernova, blasting their outer layers out in to interstellar space. Lower mass stars do not burn their fuel as quickly as the heavier ones, and end their lives in a more quiet manner. The above two photographs are of the same part of the sky. The photo on the left was taken during the supernova explosion (SN 1987A), while the right hand photo was taken beforehand. Supernovae are one of the most energetic explosions in nature, making them like a 1028 megaton bomb (i.e., a few octillion nuclear warheads). Supernova remnants (SNRs) are the remainders of the massive stars that exploded. The explosions eject hot shells of gas at speeds reaching 20,000 km/s. This explosion throws out into space the outer layers of the star. These layers are composed largely of elements produced by nuclear fusion, such as carbon, oxygen, neon, and silicon. It also produces a shock wave speeding out ahead of the ejected material, that sweeps up the material around the star and heats it to about 10 million degrees. The `shocked' interstellar medium is so hot that it is invisible to the naked eye, but glows in X-ray light. The interstellar gas is heated up by the shock to temperatures high enough to produce thermal X-ray emission. 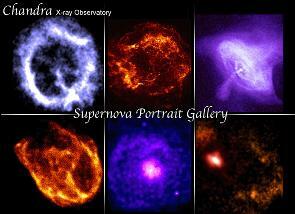 The resulting supernova shells are perhaps the most beautiful objects seen in X-rays. X-rays are emitted by the gaseous clouds while they remain hot, but they rapidly fade as the gas cools. Since the cold gas gives out very little visible light, the shells are difficult to detect with optical telescopes. The only evidence for the existence of an old supernova remnant may be a rapidly rotating neutron star (a pulsar), which may also emit X-rays. What happens to the star after the explosion? Depending on the initial mass of the star, the supernova might leave behind the core of the star, altered dramatically by the explosion. One possible form the core can take is a neutron star, a star as massive as the sun, but compressed to a diameter of approximately 20 kilometres (13 miles), and a density comparable to that of an atomic nucleus. Many neutron stars produced in this way are pulsars, sending out narrow beams of radio waves and X-rays. As the star rotates, we observe periodic radio and X-ray pulses as the beam crosses our line of sight. A second possible form for stars larger than about 20 times the mass of the sun is a black hole. How Often Do Supernovae Occur? Although many supernovae have been seen in nearby galaxies, supernova explosions are relatively rare events in our own Galaxy, happening once a century or so on average. The last nearby supernova explosion occurred in 1680. It was thought to be just a normal star at the time, but it caused a discrepancy in the observer's star catalogue which historians finally resolved 300 years later, after the supernova remnant (Cassiopeia A) was discovered and its age estimated. Before 1680, the two most recent supernova explosions were observed by the great astronomers Tycho and Kepler in 1572 and 1604 respectively. In 1987 there was a supernova explosion in a companion galaxy to the Milky Way. Supernova 1987A is close enough to continuously observe as it changes over time thus greatly expanding astronomers' understanding of this fascinating phenomenon. What Causes a Star to Blow Up? Gravity gives the supernova its energy. A supernova explosion will occur when there is no longer enough fuel for the fusion process in the core of the star to create an outward pressure which combats the inward gravitational pull of the star's great mass. 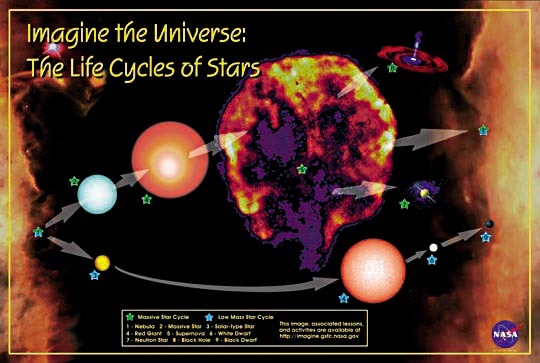 After the H and He burning finishes in the star's core, the star will swell into a red supergiant (on the outside). On the inside, the core yields to gravity and begins shrinking. As it shrinks, it grows hotter and denser. A new series of nuclear reactions begin to occur (creating the heavier elements), temporarily halting the collapse of the core. When the core contains essentially just iron, it has nothing left to fuse (because of iron's nuclear structure, fusion of iron does not release energy, but requires energy as input) . Fusion in the core ceases. In less than a second, the star begins the final phase of gravitational collapse. The core temperature rises to over 100 billion degrees as the iron atoms are crushed together. The repulsive force between the nuclei overcomes the force of gravity, and the core recoils out from the heart of the star in an explosive shock wave. The shock then propels the matter out into space,creating the supernova remnant. Why do we study SNRs? Many of the more common elements are made through nuclear fusion in the cores of stars. Supernovae scatter these elements out in to the interstellar medium. 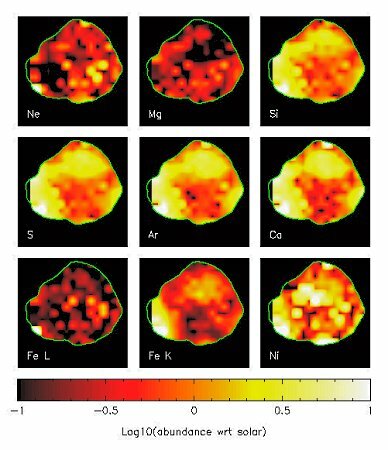 These are the elements that make up stars, planets and everything on Earth -- including ourselves. The above picture show how various elements (e.g. Ne, Fe,) are distributed within the SNR Cassiopeia A (Cas-A). Cas-A is a young supernova remnant, with a 15 light years diameter. It is situated 10 thousand light years away. It is the remains of a massive star which, having exhausted all its hydrogen fuel, exploded 320 years ago.